Vicki Vodrey, Kansas City playwright, trusted her new play to the directorial hands of Harvey Williams to shape, and produce the dark comedy about four women facing their past, present and future. The quartet proves old age is not for the tender or weak. 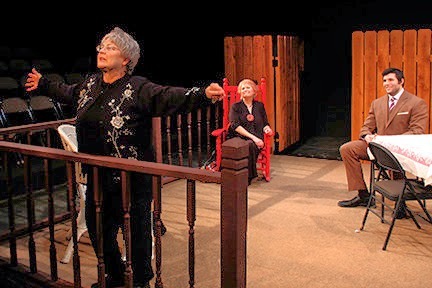 The play opens with three of the residents of Shady Pines returning from the funeral services for their good friend and Bridge partner who just passed. Upon their return, they learn from their handsome physical therapist that their newest suite mate, who has been on the waiting list for a vacancy, has arrived . . . and she’s Black. Peggy, Cindy Siefers, and Marilyn, Nancy Marcy, do not mind, but they fear Lila, Petra Allen, may not welcome the stranger, and Lila shares the bedroom with the new resident, Bertie, Sherrie Roulette-Mosley. Get ready for all Hell to break out, because the gate’s set to swing open. 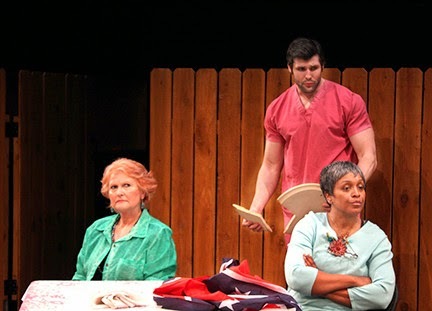 The story, set in the South, confronts both the changing attitudes or racial prejudices and the challenge to let go of old ways and start building new relationships. Expect lots of fun and jokes as the show begins, but as the characters slowly allow their facades to dissolve, the deeper feelings and drives emerge. A catalyst to helping them, Jeff the resident therapist, Jeff Smith, coaches, aids, and massages them through some difficulties. The entire cast deserves lots of credit for creating their characters from a new play. With no reviews, or past productions to use for ideas, the cast, director, and playwright entered the production with a blank slate and the chance to craft the characters. Each of the ladies and Smith created characters that resemble people everyone knows. The characters all performed with ease and balance through the play. A few minor slips did not diminish the performance. Possible a few nervous moments caused minuscule mistakes, but nothing distracted from the production. All five actors performed with skill. The play focuses on relationships and building lasting relationships. Williams concept for the show worked well and his casting was strong. The set he designed and a crafted worked well and positioned the principals so their lines were not lost in the black box theater. The crew for “The Frowning Vajayjays of Shady Pines” includes: Williams, director; Melissa E Koerner, production stage manager; Warren Deckert, technical director, set and lighting; Michelle T. Johnson, assistant director. 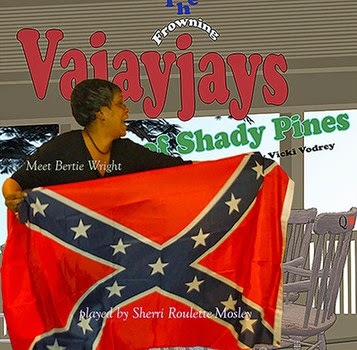 “The Frowning Vajayjays of Shady Pines” runs Thursdays through Sundays until April 6. Evening performances begin at 7:30 and Sunday matinees begin at 2. For information visit the website: www.kcmeltingpot.com or call the box office at 816-226-8087. A trio of mature women faces the reality of advancing years and the loss of one of their suite mates in a comedy/drama where friendship, new friendships, racism, acceptance, bigotry, humor, hatred, shame, illness, and death all teach valuable lessons about life and existence, in “The Frowning Vajayjays of Shady Pines,” that opened March 21.